I have always been a believer in being kind and welcoming to as many people as you meet, because you never know who they know that could effect you. This shoot is one of those opportunities! I met Carl of Rougebotic through my friend Alicia who would come to comedy shows promoting yelp. Alicia worked for Carl for a time period and brought my name up a couple times when it came to needing photography help. Because of this, I get to work on some very cool projects that really got me to stretch my photography legs and really let my creativity go wild! I hope to keep working with Carl and his team in the future, they really know how to be creative and are a laugh andhalf. One of my favorite opportunity was taking shots at a local skate jam. I was asked if I had a fish eye lens. I didn't but was really eager to rent one. I am so glad I did, I have always liked the look but didn't really have a reason to use one, now that I have, I really need one to have as much fun as I did on this shoot! 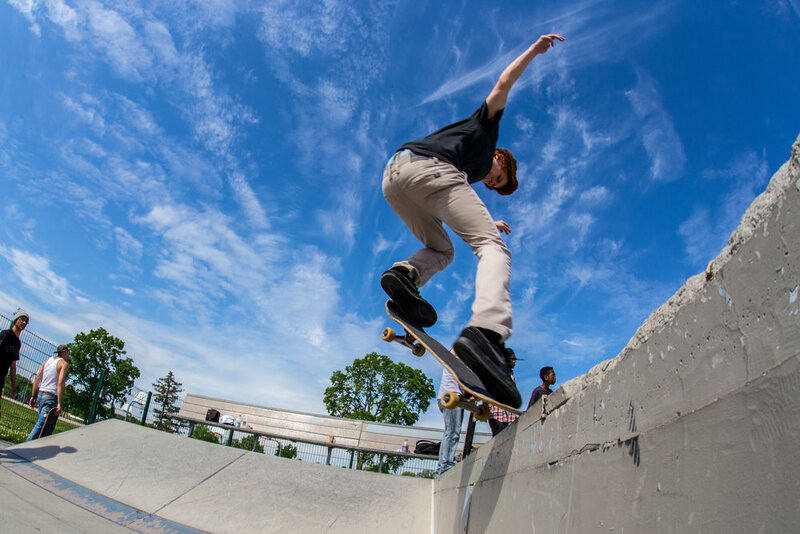 I got cool shots and I also got to see kids from all ages just plain SHRED! I wanted to skateboard as a kid, but I was too....uncoordinated to do so. I was very jealous. Another, more recent adventure, was when I was called in to do some work for the local hockey team, the Kwings. This is not the first time I have worked on something for the Kwings. Earlier that year charter tried to pitch a creative campaign for video. While I love the campaign that we came up with, I absolutely love the "It's acceptable here" campaign they ended up with. Creativity wins. This project was about their upcoming specialty nights, Ugly sweeter night, and Teddy bear toss. At this point I was nervous because this was going directly on the website and I didn't want to let carl down. But with the people I worked with that day were so much fun and creative. After it was all said and done, I grew more confident in my abilities and I can say that I really am capable of doing the work I see and respect everyday. I want to thank Carl and everybody over at Rougebotic for beliving in my skills and helping me realize that I do indeed have them. I cannot wait to see what the future holds between us and what I do with this new found confidence!